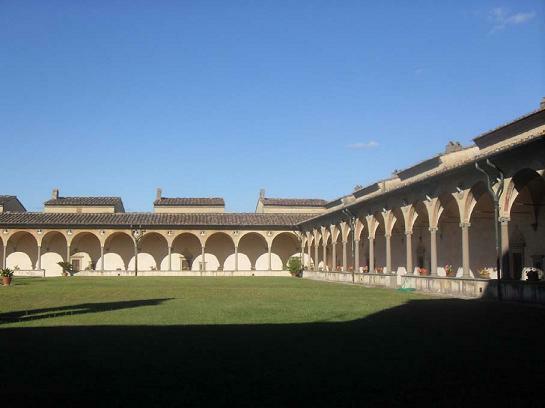 An itinerary outside Florence very beautiful to do in a beautiful day of sun is the excursion to the Abbey of the Certosa of Galluzzo. It is an extremely important monument both for its architecture and for the works of art it contains.It is situated in a suggestive and picturesque spot named Galluzzo,5 Km. far from Florence. The Certosa was begun in 1341 for will of Niccolò Acciaiuoli,an important politician.Later on it was enlarged and embellished.During Napoleon age,more than 500 works were taken away from the monastery. 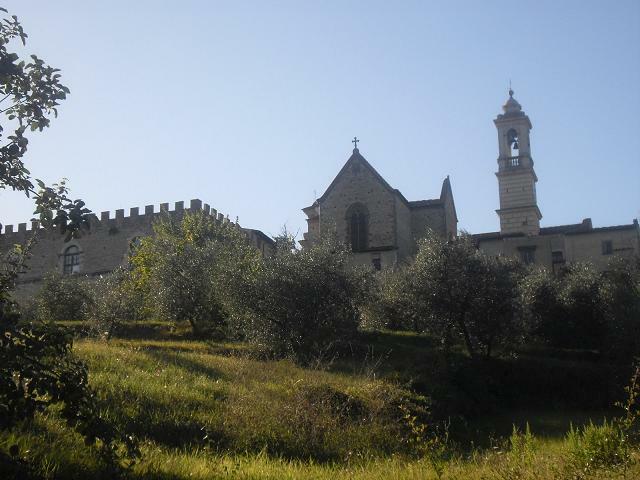 From 1958 the Cistercians live in the Certosa. Arriving at la Certosa, the first building is the Palace of Studies, in stone, commissioned by Niccolò Acciaiuoli for the young Florentines who wished to study liberal arts. When Acciaiuoli died, the activity was closed.The Palace formed by three buildings, is really an architectural masterpiece. The Picture-gallery is at the first floor of the Palace. 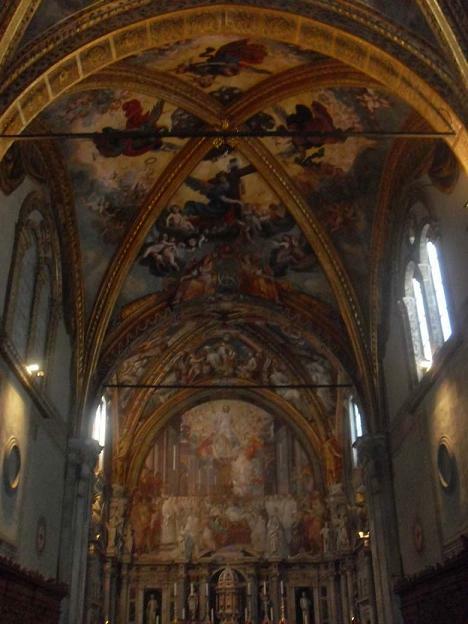 It has a trussed roof and big windows.Among the paintings,the most notable are the five lunettes frescoed by Pontormo. In the big square,it is situated the Church of St. Lorenzo, with a stone facade, believed by G.Fancelli (1546). The bell-tower is of the XIX century. In the underground chapels there is the Chapel of St.Andrew, in the form of a T and with barrel vaulted ceiling. In the middle of the Chapel, the tomb of Cardinal Agnolo II Acciaiuoli,believed by Donatello, but probable work by Francesco da Sangallo (XVI century). In the Monastery a beautiful Jesus with the Cross,a terra-cotta by Giovanni della Robbia.In the big Cloister,in pure Renaissance style,majolica by Andrea and Giovanni della Robbia.The medium Cloister is of the XVI century.The small Cloister is in Brunelleschi style. The Certosa is easy reachable going to Porta Romana in Florence and following Via Senese towards the indications for the freeway, passing for Tavernuzze. In fact the Certosa is little more than a kilometer from the Firenze Certosa exit, in the A1 freeway; once escapes from the highway it is already possible to see it in top to the Acute Mount. Exists the possibility to reach the Certosa del Galluzzo also from the railway station of Santa Maria Novella; is necessary to take to the bus number 37. The Certosa del Galluzzo has a typical aspect of a castle and see it from outside does not seem a abbey; the bell tower has been reconstructed in XIX the century. The construction was begun in year 1341 for wanting of the banker Niccolò Acciaioli whom had planned to construct a great building that collected the citizens and started them in a religious study. The Acciaoli died in 1365 and the jobs were interrupted; the works came resumed and concluded to the end of 1400. In the course of the centuries it has endured several restructures and widenings and in the age of Napoleone the Certosa endured pillages that deprived of some works of art of great value. In the 1866 become a property of the Italian State and from 1958 it returned to being a faith place, with monaci cistercensi replaced the monaci certosini. The monaci accompany the visitors in the visit of the abbey. The Acciaiuoli Palace, finished in 1500, is used like small pinanoteca and there are important works of art of important artists as Andrea and Giovanni della Robbia, Pontormo and Donatello. The Church of San Lorenzo was constructed in 1545 and introduces one Renaissance style with several restorations made in 1600. In the convent there are three chapels of 1300; the chapel of S. Tobia, the chapel of Saint Andrea and the chapel of S. Maria. The Chiostro Grande (called also 'Galilea Maior'), constructed to the beginning of the 1500's, is truly large and in the center has a typical an ancient sink in stone and wrought iron and take to the cells of the monaci. Every cell is separated from the others and was used by a single monaco who could have use of a private garden for the own contemplation. There is moreover to remembering that the monaci of the convent are votes to Hush and they cannot speak unless for half hour per week; in this small period of time they meet in the 'room of the Talk'.